People ask me this all the time. And I respond, “Yes, more often than you think!”. For the most part on-the-package recipes are wonderful hidden gems (hence, I started this blog!) but every once in a while I’ll find one that…um…isn’t. I have a special (circular) file for those and they don’t make it onto the blog. 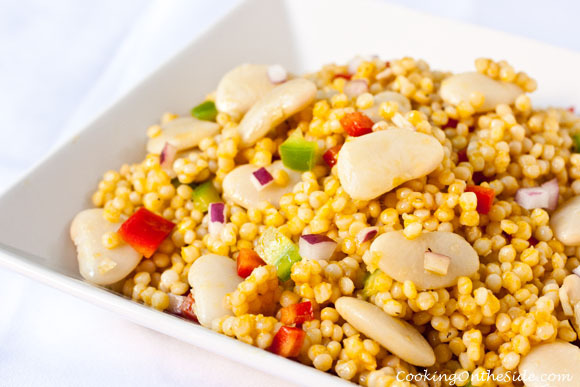 Then there are on-the-package recipes, like this very tasty one for Lima Bean Couscous Salad that I’m sharing today, that work but the directions provided on-the-package are missing important details to make it successful. That’s another reason I write this blog – to fill in those details that brands sometimes omit due to space constraints. I ultimately found the right way to make this salad, but first let me show you what I went through to get there. I woke the next morning to the disappointing mess of dry, split, skinless lima beans pictured above (that’s before I drained them, by the way). Maybe they would have still been salvageable and edible if these were going into a purée, but I was making a salad (that I was hoping to photograph!). I was so frustrated. Countless Google search results later, I determined the dry, split, skinless bean problem likely arose from either the way I soaked the beans (clearly not enough water) or the fact that I soaked them at all (apparently it’s not even necessary). I’m hardly a novice cook, but I’ve never prepared dried lima beans before. Wouldn’t it have been helpful if the package had mentioned, “fill the pot so the water rises at least 3 inches above the beans”? As I continued to look for lima bean soaking advice I thought to check Bob’s Red Mill’s own website. 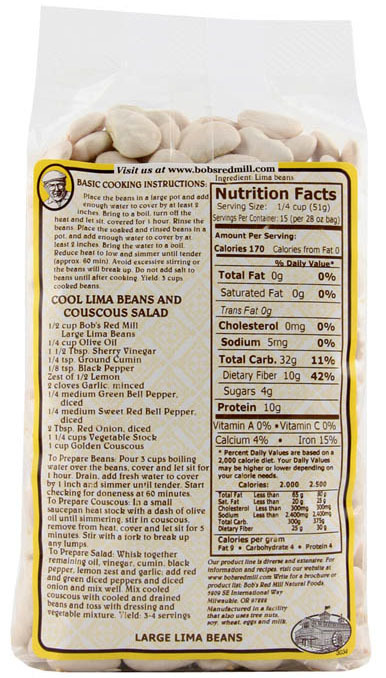 I found the Large Lima Beans on the site, and I noticed that the recipe on the back of the package in their photo was different from the bag I had in my kitchen. Moreover, the website photo didn’t say to “Soak beans overnight.” Instead, it suggested a quick soak method which I’ve come to learn is a bit more reliable when it comes to keeping the beans intact. My husband went back out to the store for new beans and I gave this new quick soak version of the recipe a try, with much better results. The beans, for the most part, didn’t split and they came out nice and tender. My best guess is I had an older package (even though I’d just purchased it the day before) and they improved the recipe in the new packaging. I opted to combine the beans with Israeli couscous rather than standard couscous because I prefer the look of the large pearls (NOTE: Israeli couscous is prepared slightly differently than standard couscous, so be sure to follow the specific directions for whichever type of couscous you decide to use). This is one of those salads that taste even better the next day, once the flavors of the sherry vinaigrette have had a chance to seep into the beans and couscous. All’s well that ended well! To prepare beans: Pour 3 cups boiling water over the beans, cover and let sit for 1 hour. Drain, add fresh water to cover by 1 inch and simmer until tender. Start checking for doneness at 60 minutes. To prepare couscous: In a small saucepan heat stock with a dash of olive oil until simmering, stir in couscous, remove from heat, cover and let sit for 5 minutes. Stir with a fork to break up any lumps. To prepare salad: Whisk together remaining oil, vinegar, cumin, black pepper, lemon zest and garlic; add red and green diced peppers and diced and onion and mix well. 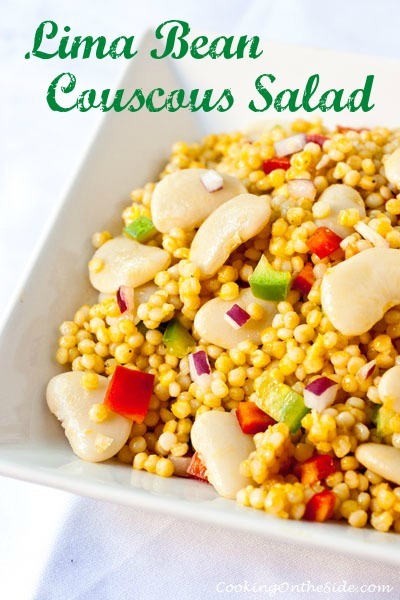 Mix cooled couscous with cooled and drained beans and toss with dressing and vegetable mixture. I’ve never tried cooking dried lima beans – glad you figured out how to do it and alerted Bob’s Red Mill. I do love their products so I’m glad they were quick to respond. Gorgeous! The soaking overnight it was always gets me. I forget until it’s too late! I haven’t even prepared dried beans… period. I have chickpeas in my pantry that I’ve been meaning to use, but they’ve just sat there. Thanks for sharing your story (struggles and all). The dish looks like it came out great though! 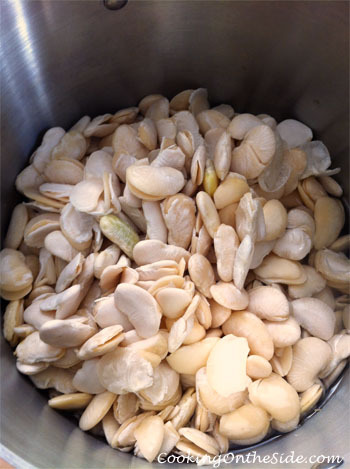 I’ve never cooked with dried lima beans either–I usually buy the frozen ones. But I love them and this salad sounds delicious! I have soaked northern and kidney beans overnight with no problem. Also, you should use salt. My advice on matters like this is cooks illustrated who I believe do a great job of testing this sort of issue. love these ingredients! Have a great weekend! Previous post: Angostura and Soda…Happy 100th Birthday, Julia Child!